Who’s your most inspiring teacher? That is the question we asked on NulisBuku.com & Biovision’s writing competition with theme: Vision for Education in Indonesia: Gratitude to My Teacher. It got 200++ short stories submitted in less than 2 weeks. And finally we announce 3 winners, @Aida_aie @Steve_Me_Pure @Wuri27to experience free traveling to Belitung Islands in the launching event. I represent @nulisbuku, with @mata_Biovisionteam, accompany them to enjoy Belitung. I tried to act like a private writing coach for Aida, Steve and Wuri during the trip. They can ask anything about writing to me. From our conversation, I know a little bit about them. Aida already has a published book, Wuri used to work in media, and Steve. Steve is a sports teacher. There are 2 reasons he participated in the writing competition. First, he wants to prove that a sports teacher (who related with physical education) can also write. Second, he wants his students to see that they can do anything they want in life, if they try. I am so impressed with Steve’s burning determination. 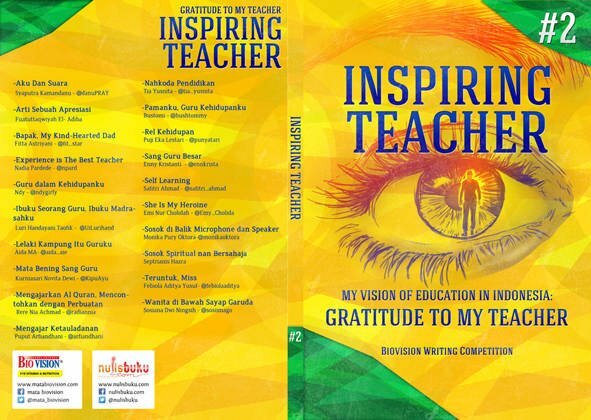 He won a writing competition and surely, he’s one of the inspiring teachers! In Belitung, we enjoy the beauty of the islands, and also meet one of the most inspiring teachers in Indonesia: Ibu Muslimah. She’s the teacher of best selling author Andrea Hirata, who wrote a based on true story novel ‘Laskar Pelangi’ about his school and his inspiring teacher. The book finally turned into a movie and since then has helped boost the tourism side of Belitung. I personally think that’s what a writer should do, to inspire, one person at a time. Meeting bu Muslimah was another inspiring moment for us. She’s a true teacher. Showing us around her house, looking at pictures of her life as a new ‘icon’ in education. 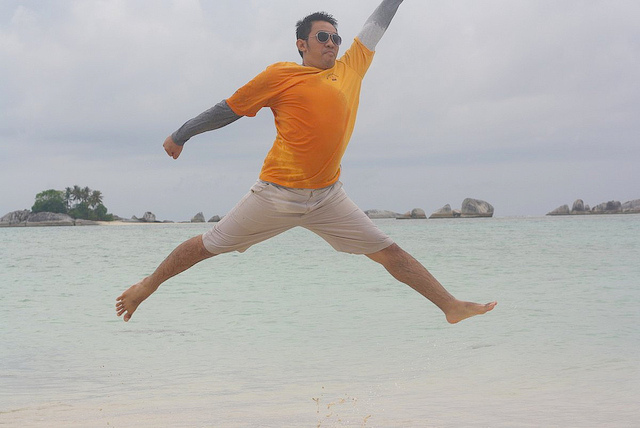 Many people has inspired by the story of Laskar Pelangi, and the inspiration touch people differently. Bu Muslimah said, there are a lot of people suddenly hug her when she was at events, and they would tell her how their life changing because of the book and the inspiration from her story. She said, this is beyond her wildest imagination, she never expect something like this could happen in her life: a teacher from an elementary school in a small village of a small town in Indonesia can inspire people around the world. Masha Allah! Anything is possible! Thank you Biovision team, Bu Ermi & Mas Rahmat, for all the support during and after the competition. And also @BelitungLiburan who organize the trip. It was a pleasure working with @mata_biovision& @BelitungLiburan! So, friends: start writing, start inspiring. Have a productive day!